What's All This About Bandscopes? You don't have to be a General or higher to take advantage of HF contesting fun this weekend as the ARRL 10 Meter Contest lights up the band. Technicians (and the few remaining Novices) can participate right in the thick of the action. The following weekend is the CW edition of the ARRL Rookie Roundup - pound a little brass and raise your code speed another few notches. CQ WW logs were due five days after the contest - earlier than reported in the previous issue! Brad AA1IP notes that gentleman who achieved trans-Atlantic DX with a QRPP transmitter was in this instance Michael Rainey, AA1IJ. Also, the video "I Want a Big Tower" was done by KT8K and Phil Gildersleeve's call was W1CJD, not W1ICD. I can't wait to see my log checking report for CQ WW CW. The VooDoo Contest Group is hanging it up following this year's last spell of operation from EL2A. As Ned AA7A reported, "After 18 years of wandering around in West Africa, the famed VooDoo Contest Group's hardware has been disassembled, parted out and distributed among returning operators, local EL operators and club stations or pounded into raw metal. The VooDoo Contest Group spirit survives and we may mount another operation next year from somewhere, but it will not be in West Africa in proximity to EL and the tired pile of VooDoo hardware." As a long-time fan of the VooDudes, I can only tip my hat in admiration and offer "Well done!" on behalf of the many Contest Update readers who logged many a welcome multiplier from their efforts. Now is the time to get prepared for the new categories in ARRL VHF+ contests discussed in the previous issue: FM-Only and 3-Band. Aimed at entry-level VHF+ contesters, take the opportunity to publicize these categories in your local club newsletters, meetings, and online discussions. Folks new to contesting probably won't have contest logging software so you can help them learn about that, too! This is certainly a "teachable moment" so start early - don't miss the opportunity. It's a good idea to perform a test transmission of your CW messages before the contest gets going - I heard one station sending "CQ SS" at the beginning of the WW CW contest. Maybe "SS" is a cut form of "WW" but I doubt it - I can't say that I've not made similar mistakes though! Jim K1TN confirms that radio-sport.net has ceased online publication, noting that a final wrapup by Jamie NS3T has been posted on the site in the past couple of days. 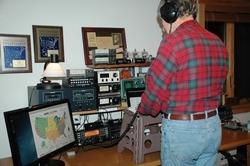 The Potomac Valley Radio Club newsletter for December contains lots of photos of member shacks - some little, some mighty, some SO2R (Single-op, Two Radios). A "virtual open house" is a great idea for your club newsletter, too! This is the time of year when many clubs have elections. If you or your club is looking for guidance as to how to run an election, Robert's Rules of Order for Elections is available online. Robert's Rules can seem a little formal but they do help a group conduct business in an orderly manner. "Gee whiz," says the 3830 data master aggregator Dink, N7WA, "Less than 24 hours (after CQ WW CW - Ed.) and already more than 480K of soapbox comments!" Web Site of the Week - From the latest West Mountain Radio newsletter comes word Joe K1JT has released a new version of WSJT called WSJTX that includes a new mode called JT9 primarily designed for LF/MF. It is similar to JT65 but with a much reduced bandwidth. The mode is being used on the 30 meter band at 10.130 USB. Comfort - In the ergonomics department, Kirk K4RO reports that the best new accessory in his station during CQ WW CW was a big exercise ball. Using it as a chair at times stretched muscles and provided "huge relief to lower back and legs." Your editor also enjoyed the results of a new dual-firmness chair pad from Relaxobak, recommended by Rick K6VVA. The photo at right shows how Bud W2RU operates standing up with a small stool providing the necessary "lift" to his keyboard. After relating the suggestion of compression socks, I heard from fellow Contest Update reader and contester, Steve N8WL whose Activskin product line includes full-support hosiery designed for comfort while being worn for long periods. 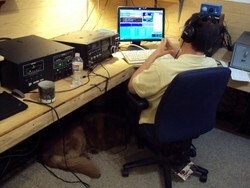 Attention to comfort keeps the operator healthy, happy, and most importantly - on the air and making points! Fred K3ZO sent along a link to this video taken during the SEANET convention, illustrating what a great institution ham radio is in furthering international understanding and brotherhood. You might even understand why someone would pass up a major contest in order to attend. Just at the end of the CQ WW CW contest, your editor was watching the N1MM logging software's Gray Line window. At 0000Z as the Sun hit the western boundary of the map, a quirk of the program turned the whole map to night for one minute. How appropriate! 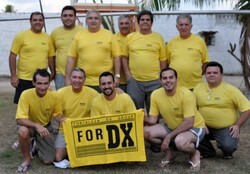 Tack JE1CKA reports that the Japan International DX Contest committee has uploaded the JIDX 2012 CW results. JIDX Phone logs are still being accepted - check the Logs Received list to be sure yours has been accepted. From Doug K1DG, "I *think* these are still the highest country totals worked during a contest on one band. 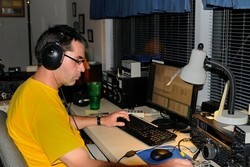 On SSB: K3LR 192 (20 meters) and PJ4B 190 (15 meters) both in the 1999 contest." If anybody else has documented higher totals, please let the editor know about it! Don't confuse other participants by transmitting information in an unexpected order or at an unexpected point during the contact. For example, send your Sweepstakes information in the same order described by the rules: number, precedence, call sign, check, and section. Remember that "thanks" is most often used to conclude a contact and is usually interpreted as "QRZ?" Sent too early, TU cues callers to begin calling while you are still in the middle of a contact - this gets the whole pileup out of sync and slows everything down. To maintain rhythm and rate, don't confuse your customers! Arne N7KA recommends this explanatory website for clearing up the mystery of bearing types. For up to the minute propagation information, Thomas NZ4O has created his MF/HF/6M Radio Wave Propagation Subscription Service. The $30.00 per year subscription is for daily MF/HF/6M radio wave propagation forecasts similarly to the emailed DX bulletins. For Yagi designers, a trio of programs are available to help you with the mechanical design of the elements for survivability under wind and ice loading. YagiStress by Kurt K7NV is perhaps the best-known of the three. Bob KØRC has converted the W6QHS (now W6NL) Lotus element taper spreadsheet to Excel 2003 XLS format. The spreadsheet has some new worksheets from the original and Bob's Revision 3 of an SWR charting tool is also available. Steve W3AHL recommends the $39 DX Engineering design tool, Yagi Mechanical. Once an antenna has been designed with a constant element diameter using EZNEC or similar modeling tools, these mechanical design tools can be used to change the element taper schedule to achieve the required mechanical properties while keeping the element resonant at the right frequency. To prevent vibration from loosening the bolts holding a rotator to the tower mounting plate, Jim KØXU first installs a stud, held with Loctite thread locking compound and a jam nut. The protruding studs also make it easier to align the rotator with the holes in the rotator plate. A jam nut is also added to the nut below the plate. Even if the nuts come off, the rotator still can't move. Technical Web Site of the Week - The December issue of the Packrat VHF "Cheese Bits" newsletter contained a detailed article about the use of multiple band scopes for VHF+ contesting. "What's All This Multiple Bandscope Stuff, Anyhow?" By Roger W3SZ is a good example of how to make good use of this new tool for contesters. Big contests like CQ World Wide really test our ability to coexist in our limited amount of spectrum. As I've observed before in this column, radiosport is one of the rare competitions requiring the contestants to cooperate with each to score points. No cooperation, no points. The increased activity of late requires particularly intense cooperation. Of course, what constitutes effective and appropriate cooperation differs between competitors. There are a wide range of strategies varying from casual search-and-pounce to all-out 48-hour scouring of the bands for contacts. As a result, there are no one-size-fits-all "best" practices. Nevertheless, there are basic requirements everyone must satisfy: call signs and the exchange information must be transmitted and received so that both stations can submit a log containing the correct information. 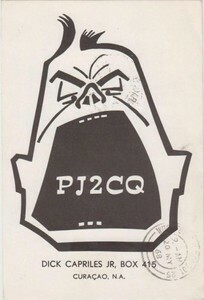 This QSL has cooperation written all over it! Jeff K8ND pulled this card out of a collection from a 1967 QSO. That's an odd way of describing the requirement: ...so that both stations can submit a log containing the correct information. Note that I didn't say, must be transmitted and received correctly. What's the difference? The second, more conventional statement implies the information has been exchanged in real-time. The first only requires that the information be recorded correctly in a log and that is all that the sponsors examine; the log. Also unlike most other sports, radiosport scoring is based on the contents of a written record after the competition is finished. As such, it really doesn't matter how the information makes its way from one station to the other as long as the methods comply with the requirements of one's entry category. That makes it possible to not even transmit some aspect of the information, such as call signs, if one assumes that it is known either from previous contacts or over some other channel, such as spotting networks. 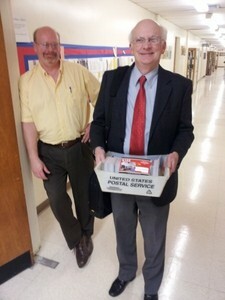 The debate about sending one's call has been going on for at least thirty years. The top-scoring, most experienced operators endorse the technique of not sending their calls during every contact as one method (among many) of controlling pileup size. (Note that I am referring here to DX stations and not getting into issues of satisfying FCC rules about identification.) As long as the pileup inhabitants don't have to wait "too long" (whatever that means) and the DX station is good at pulling complete calls out of the pile and behaving consistently from contact to contact, rate for both the caller and callee are maximized. It is easy for this to break down, of course. The most common reason for chaos is poor cooperation by the callers, such as not listening and calling out of turn or getting out of sync. The bigger the pileup, the more likely these will occur, leading to a large mess best described as a "snarl" or "swarm". If you've ever been on the DX end of a big pileup, you know how hard it can be to maintain rate when the callers won't use good calling technique. Another cause for pileups to break down in disorder is when the DX station behaves erratically; such as changing the response from contact to contact or not being able to pull out full calls with lots of back-and-forth to confirm information, to name just a couple of reasons. It is much, much easier for a station in the pileup to maintain discipline if the station running the pileup is consistent and gives clear signals as to what to do. So there is a bargain to be made: The callers are expected to listen, not call out of turn, and give their full calls while the DX station is expected to establish a consistent and effective pattern of operating to which the callers respond. Part of that effectiveness is identifying one's call. Too many stations were heard during the CQ WW CW contest not giving their call signs for excessive periods - minutes at a time in some cases. This violates the bargain that underlies cooperation, especially from the perspective of the callers who are giving up extra time for no additional benefit to them. Is it the assumption that callers are getting the correct call sign from the spotting networks? Consider that from the final CQ WW Claimed Scores, there were 2604 Single-Op, All Band logs (all three power categories) and 1735 Single-Op, Assisted logs. Assuming that single-band logs were submitted in about the same ratio, 60 percent of the callers were not connected to the spotting networks. Thus, if a station is not sending a call, more than half of the stations available to the pileup have no idea who the station is! They have to either sit there and wait for a call sign to be sent - which costs them QSOs - or they have to tune away from that pileup and come back later which is a risk that they will miss out on a contact. It also means a lot of them are guessing the call - so they are either making a duplicate contact or putting the wrong call in their logs. Not just logging a busted call for which they would get the penalty but probably logging the call of a different active station they think they are calling which causes the DX station to get a NIL (not in log) penalty, as well! This is not a good tradeoff and a good reason to limit the practice of sending call signs infrequently. Note that I am not opposed to giving your call "every few QSOs" as a matter of practice or kicking it into high gear and working a half-dozen stations in a quick burst without giving your call. This is a long-established and successful method of controlling pileup size and keeping the rate up for everybody. What I am opposed to is a station going ten or twenty QSOs (or more) on a regular basis before identifying. It wastes the time of the callers and leads to unnecessary log checking penalties. It is bad practice and poor cooperation. Should there be a rule requiring sending a call every X contacts? Well no, but I think there should be clearly-expressed expectation that stations running pileups should avoid long periods of not giving their call signs. A rule is too inflexible and who is going to enforce it, realistically? I am as frustrated as anybody else but I eventually must agree that we can't fix this particular problem through more rules. It can be addressed through education and by pointing out good technique. For example, in the CQ WW CW PJ2T, ED9Z, PJ4A, PJ4D, CW5W, EL2A, YN2CC, NH2T, HK1NA, 8P5A, LT1F, ZD8W, and the big KH6 and 7 stations - among others - all made lots and lots of QSOs while signing quite frequently. Not every time and I am not saying they were all on best behavior from beginning to end...but certainly enough to keep order and not raise blood pressures around the world unnecessarily. Good job - thank you! Scores and participation have been increasing over the past years. Pileups are getting really, really big. The contests and the band openings aren't getting any longer. This puts more pressure on us to behave well during the contest. We need to focus on cooperating with each other - on both ends of the pileup. Callers and callees both need to maintain a disciplined approach to pileups that does not disproportionately require either group to waste time, forego contacts, or risk higher log checking penalties. It's called cooperation and we all benefit from it.